There were a bunch of great answers in the comments last week, and everyone was right about what Justin did wrong. 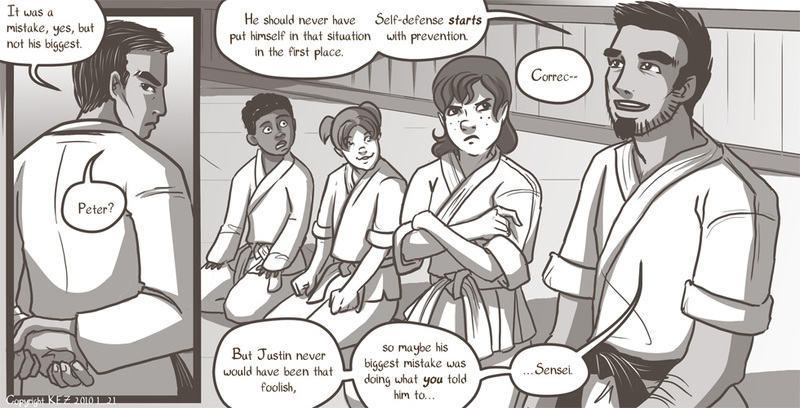 Those of you who have taken martial arts however, may be aware of the Sensei who takes pleasure in setting people up to make GREAT examples of what not to do. Justin was a victim here. The poor trusting sap! And we have a new character mentioned by name here! I WONDER WHO HE IS AND IF HE'S MENTIONED ON THE CAST PAGE OOPS I JUST SPILLED SOME BEANS. One last page in this arc! WHEE! I'll mention it yet again, I'm offering a VERY special commission deal! I have a bunch of bills due, and until they're paid off, I'm doing $15 commissions. Yup, that's 1/3-1/2 off the usual price! This covers any 1 character (full color) on simple bg and/or prop. You can see five of these up at my DA as examples of what I'm offering. BUT! There isn't much a back and forth process here for tweaking like my normal commission process, so it's a wee bit wildcard! Everyone has been happy so far though! Email me at warofwinds@gmail.com for details! Current queue is 3 commissions, with 1 person who has prepaid for two more. Current ETA of all commissions is <1 week.